Himachal Pradesh rise from the plains to high Himalayas and beyond, moving across mountain range north to Lahul and Spiti Valley. The three main river valley in the state Kullu, Kangra and Chamba have their magical allure. Nestling in the Kullu Valley is Manali and there is Dharmshala in the Kangra Valley, Which was chosen by his Holiness Dalai Lama as his home. In the Chama Valley is Dalhausi – a quaint charming hill station. And finally, There is Lahul, in a world of its own. Very Buddhist, Very snowbound. The Kullu Valley has an ancient town in its lap called Manali, Surrounded by towering peaks at an arm length, Manali’s major asset is its proximity to the snowline. It is flourishing orchard industry, a popular honeymoon destination and trail head for numerous treks as well as a great countryside ideal for adventure sport lovers. Manali literally means the “Home of Manu”. Manu is the mythological who is supposed to have survived when the world was drowned in flood. He then come to Manali and recreated human life. 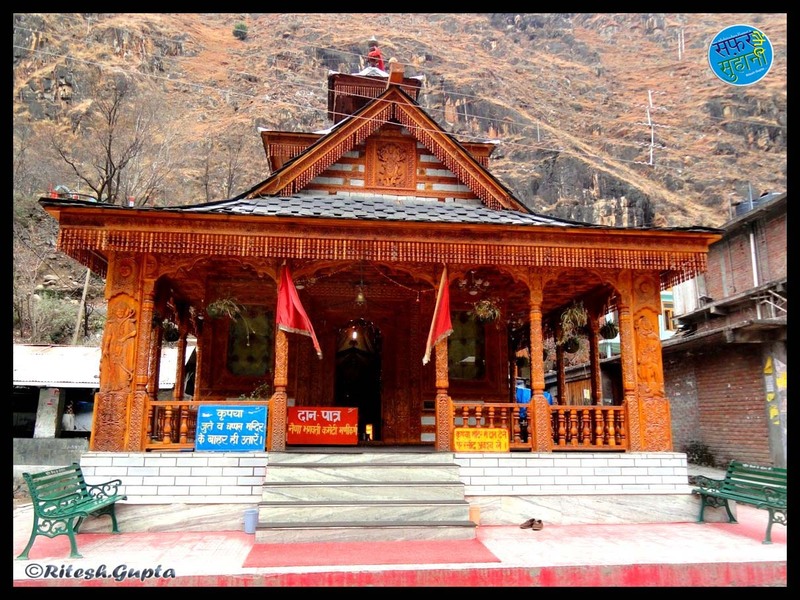 Thus, The area of Manali is sacred and Hindus treat the Temple over here as pilgrimage. If any one want to spend some time in the lap of nature then go to Manali. Manali town is Located the left bank of the Beas river. By Air → The nearest airport (about 50kms) Bhuntar is connected by Jagson Airlines with Delhi. By Rail → The nearest most convenient rail head is Chandigarh (about 397Kms). The other nearest narrow gauge rail heads are Joginder nagar (About 166kms) with the change at Pathankot and Shimla (About 260kms) with a change at Kalka. By Road → Manali is on the NH-21 Motorable road sand regular bus services connect Manali to Delhi. Temple of Manu (मनु मंदिर) → Temple of manu is 3kms from the Mall Road in Old Manali lies the temple of Manu Rishi, Believed to be the only temple of Manu in India. Arjun Gufa (अर्जुन गुफा)→ Tha Gufa or Cave of Arjuna where he practiced austerities to get Pashupata Astra or weapon from Lord India. This Cave is 5 km away from Manali. Hadimba Temple (हिडिम्बा देवी मंदिर) → Hadima or Dhoongiri temple is dedicated to goddess Hadima, wife of Pandav Bhima of Mahabharta fame. This four-story wooden temple is located in the middle of a forest called the Dhoongiri Van Vihar. Temple is 2 km away from Mall Road of the Manali. The Mall (मॉल रोड ) → The Mall road is situated in old Manali. It is approx 1km long. Many type of Himachali Handicarfs, Arts, Foods, Restaurant, Shopping Complex, Hotels at Mall Road. Mall Road is the life line of Manali. Vashisht Kund (वशिष्ठ कुंड ) → This pyramid shaped temple is dedicated to sage Vashisht. Around this temple there are hot springs and waterfalls. The bath houses here are made in the Turkish style. Vashisht Kund is 3 km away from Manali. Club House (मनाली क्लब हॉउस) → Club house is vary nice place. It has indoor and some outdoor adventures game facilities. It is located on the left bank of Manaslsu Nallah. There are some picnic spots near flowing Manaslsu Nallah. This spot is 2 Km away from Manali. Tibetan Monasteries (तिब्बतियन मोनेस्ट्री) → There are 3 newly constructed colorful monasteries, where visitor can buy carpets and other Tibetan handicraft. Two are located in the town and one on the left bank of the Beas river. Van Vihar (वन विहार) → This is very nice picnic spot surrounded by lush green forest. It has good landscaping and children park. It is located near Mall Road and have to pay the entrance fee to go inside the park. Kothi (कोठी) → It is 12kms away from Manali. One km away from here, the river Beas flowing out of a 30 miters deep pit, to surrounded by rocks, offer a beautiful sight. On these rock reside innumerable pigeons. Rahla Water Falls (राहला झरना) → It is 14kms away from Manali. It is a picnic spot with the view of the river Beas falling from height of 50 meters is breath taking. 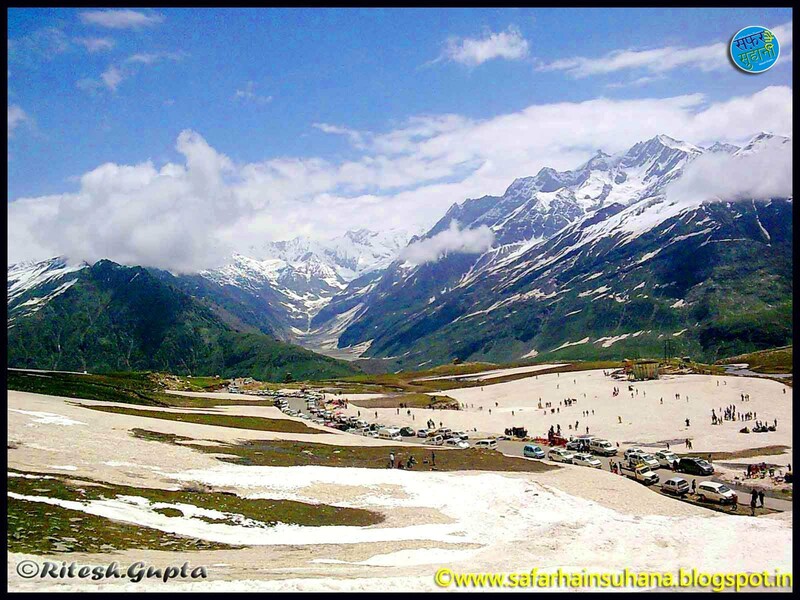 Solang Valley (सोलंग घाटी) → It is situated 13 km northwest of Manali. It has fine ski slopes. Solang valley, also known as Snow Point is famous for its 300 meters ski lift. Snow-capped peaks and glacier make this majestic valley an ideal place for winter games. In Summer, can enjoy Paragliding, Parasuiting, zorbing and horse riding. Nehru Kund (नेहरु कुंड) → This is a beautiful picnic spot surrounded by cold waterfalls, springs and a peaceful atmosphere. It is situated 5 km from Manali. Rohtang Pass (रोहतांग दर्रा ) → Rohtang Pass is the wonderful place of Himachal Pradesh. Rohtang Pass is the highest point (13050 Ft.) on the Manali kelong (Leh) road NH-21. It provided a wide panoramic view of the Rohtang valley mountains rising for above clouds, which is a sight truly breath-taking & unforgettable . 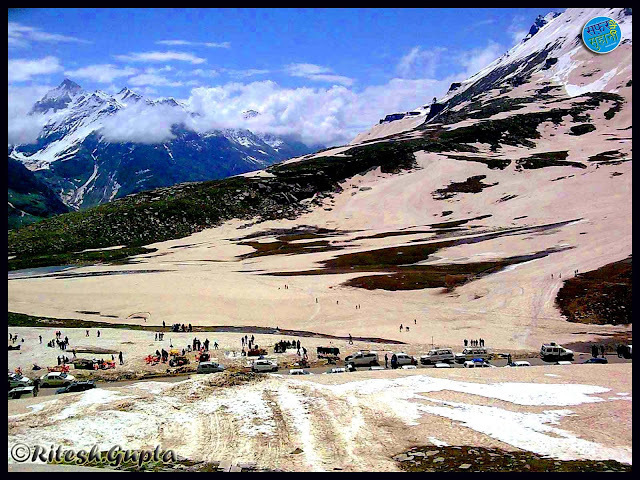 Rohtang Pass is situated 51 km from Manali City. Manikaran (मणिकरण) →Manikaran is located in Parvati Valley and just near by Parvati River. 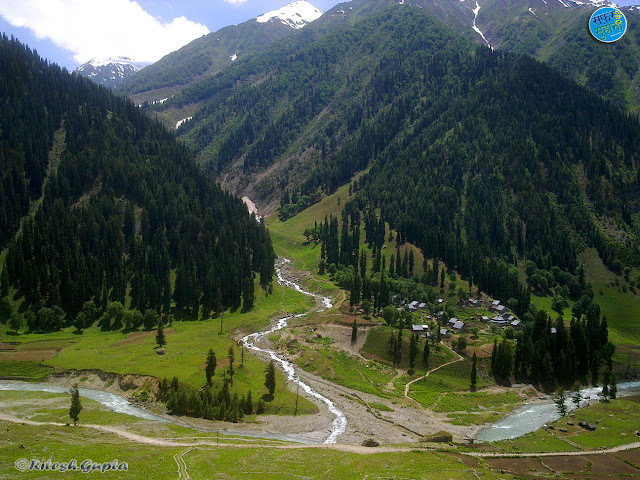 It is situated About 45km from Kullu & about 83km from Manali. Manikaran is the mainly pilgrimage center for Hindu & Sikhs. There is a Gurudwara & Many Hindus Temple is situated River bank of Parvati. Manikaran is famous for its Holy Hot Spring water & its wonderful Landscaps. It was the some information about Manali & Near by. I think, you would love it very much. Please give your view about this post by your valuable comments. Very useful information Ritesh ji. I had gone through your Manali series which consequently tempted me to plan my trip to such a beautiful place. Though due to some unavoidable hindrances we couldn't go to Rohtang but still the sweet memories of the tour are still alive in my soul. Thanks a Lot Mukesh Ji. I have read your Manali Trip Story. That was also wonderful. Don't Worry Rohrang will see at next trip. बढ़िया जानकारी रितेश भाई, मैने हिडिंबा टेंपल, वन-विहार और सोलांग घाटी देखा है ! मैं यहाँ फ़रवरी-मार्च 2012 में गया था ! सुन्दर....बस शिमला तक गये हैं..शायद कभी जाना हो पाये इतनी सुन्दर जगह!! Thank you so much. The blog you have written about Manali is something so informative that the entire journey to this place can be planned by anyone, I am grateful to you for providing this information. My trip to Manali literally called Devghar-the place of the Lords is planned with my family. Nice pictures. Thanks for sharing this post. The nearest airport to Manali is kulu airport, kullu which is 33 KM away from Manali city centre. Explore and Book - Hotels near kulu airport.Also see - how to go from manali to kullu. Check out nearest airport to manali also. Thank you Ritesh For providing such an important information. If you have knowledge of Triund in Dharamshala please post it. Yes, Manali is famous for trekking tours and adventure activites. Lofty mountains with finest of slopes, water streams and splashing rivers make Kullu and Manali in the foothills of Himalayas. Himachal is a great place to enjoy. Visit us for Bangalore to Manali honeymoon packages here. A trip from Chennai to Manali is increasing exponentially. Either it’s a honeymoon or family trip you will enjoy throughout the trip. Give a chance to KulluManali.org to plan your trip.